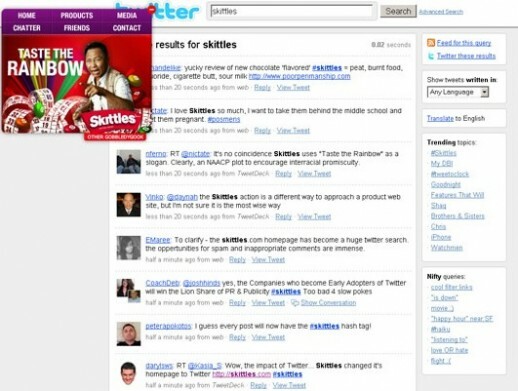 During a period of uncertainty, not just in global economics, but in a growing medium called Social Media – Skittles.com got BOLD and just may have set a new trend…by transforming their skittles.com website into their Twitter Feed. The only thing left that on Skittles site is a mini navigation console in the upper left corner of one’s screen. As many companies are only now beginning to realize the power of social media and how it can literally transform a brand – overnight…only a few are beginning to dip their toes in the unknown waters of Social Media. Is it because they are scared of what others may say about them? I mean, I’m sure they love their company and with their own bias feel as they are King of their industry, so why not open up the lines to what their audience has to say? Why send users to their own PR generated pages? Don’t you get it yet? You are Social, we are social, humans are social! We always ask advice and almost always value the opinions of our friends and others – either to take as is or debate the reason. Why not offer your audience a medium to share and learn about your brand? I think it’s very bold and mighty courageous what the Skittles Marketing Department has done. Time will tell how this works out for their brand, but so far the web is a buzz with it…so maybe this is a good thing? Maybe this will really boost sales for more candy, just because of the Skittles “Socially Cool” Factor, and just maybe more brands will follow suite or try to innovate similar things, or maybe they won’t, and maybe those brands that don’t will lose out to the “socially cool” brands that do. Next PostThis could be rad: Daft Punk to score Tron 2.0? Links should work now. My Barbie’s knees creaked to an awkward poostiin. She didn’t really sit, she kind of lounged, only really adding to the whole come hither thing she had going on. Blogging makes me happy. Remember I survived cancer makes me happy. Eating jellybeans when I have low blood sugar makes me happy. Playing cello makes me happy. And finding your website makes me happy! Peace Yall. I think the “tank tops” are real fly but the baseball Tee really caught my attention. I’d like the purchase that ASAP! SOOO many dope designs! I’m glad to see things are continuing to evolve! peace.